Today is the 96th anniversary of the agreement that officially ended World War I, an official holiday in many countries that was once known as Armistice Day. Armistice is a powerful word, literally meaning the cessation of hostilities. The nations that had spent four years embroiled in armed conflict truly wished for it to be “The War to end all Wars” and established the annual commemoration to recognize the sacrifices and losses sustained on all sides. Let us not forget that these losses disproportionately impact the marginalized/targeted and oppressed. However significant the military losses, the so-called “collateral damage” and impacts that linger long after the guns go quiet have stronger ripples among the poor and in communities of color. Sadly, it was hardly the end of all wars, and over time most nations have chosen to rename the holiday. Most now call it some form of Remembrance Day, focusing on the soldiers but also pausing to reflect on all the casualties of war. In the United States, it has become Veterans Day, a fairly explicit recognition of the combatants. A British group known as Armistice Pals is using this year’s holiday to raise awareness of the costs of war and to campaign for peace. What a novel idea, to campaign for peace. Helen Meissner, the director of the Folkstock Arts Foundation — dedicated to supporting acoustic musicians — recognized the long connection between folk music and peace campaigning. She assembled a group of like-minded individuals and organizations and Armistice Pals was born. The group’s inaugural activity was a special recording of one of the finest anti-war anthems ever written. Where Have All the Flowers Gone? was written by the late, great Pete Seeger with Joe Hickerson in 1955. With its powerful imagery and striking chorus — “When will they ever learn?” — it has been recorded hundreds of times in dozens of languages and been awarded many honors. That’s a powerful vision for using remembrance as a tool for avoiding future conflict. Armistice Pals gathered dozens of folk musicians from several generations to record a stirring new version of Where Have All the Flowers Gone? Peggy Seeger leads the rousing chorus that closes out the song, and the producers include a few lines of Pete Seeger singing the original recording. Noting how community action can resolve — or avoid — conflict, Peggy celebrates the healing power of communal singing, calling it a big part of her brother’s legacy. He loved getting people to sing together! Let us use Armistice Day 2014 as a time to reflect on the painful price of conflict and a time to work together for peace. 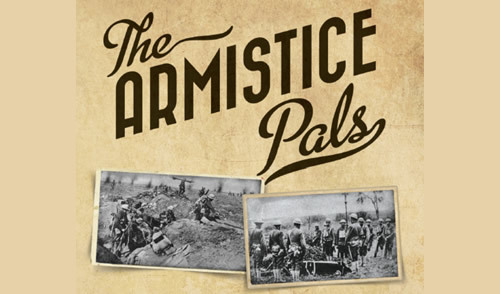 More information on the Armistice Pals project, including an interview with Peggy Seeger and the lovely recording can be found at Folk Radio U.K. The new version of Where Have All the Flowers Gone? went on sale on November 9 and can be purchased from Folkstock Records as a special edition including three other tracks. Proceeds will go to the Foundation for Peace, Peace Through Folk, the Malala Fund, and the British Red Cross. I hope we can all take a moment to reflect today on how each of us individually and collectively can make the world a peaceful place.